Do you have speech problems due to dentures? Are you tired of the gooey mess due to removing dentures and moving dentures? Are you having problems with the fit of your dentures? We have a solution to all the above problems! Overdentures are similar to your current dentures but they are held in place (retained) using dental implants. Dental Implants are small screws that are inserted in your jaw to hold the denture in place so that it fits well and does not move. The implants are placed in a very simple and safe surgery by the expert doctor who is called an implantologist. He is a dental surgeon who is an expert in conducting implant surgeries. 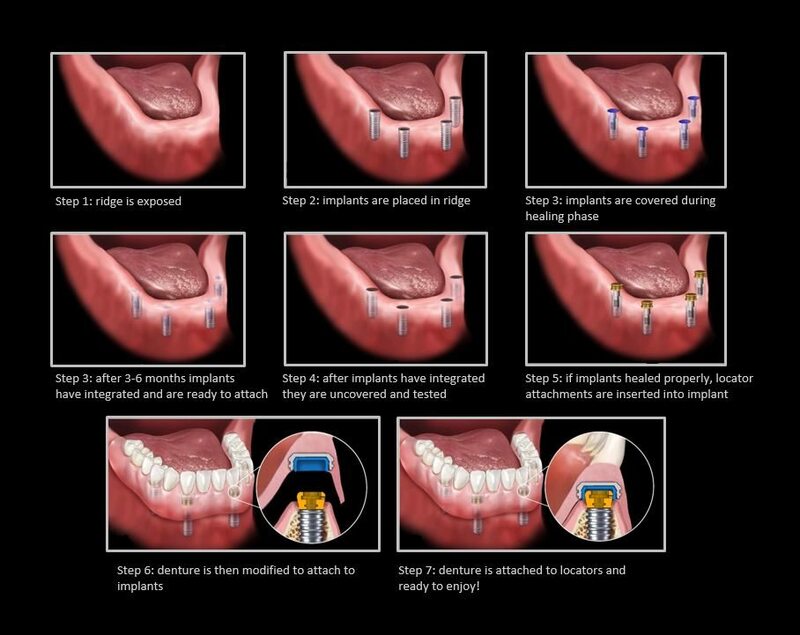 These implants are then covered by a cap which is called a locator that fits onto counterpart on the denture. It is a snap fit and does not allow the denture to move. Traditional dentures have a lot of fit problems due to which they are loose or are not very comfortable since the move. Overdentures are helping in place using dental implants and so do not move. Since the overdentures have better stability and better fit in the patient’s mouth, the patient is more comfortable while chewing. This ensures better chewing and mastication of the food. This helps your digestive system to break down the food more efficiently and hence absorb more nutrients. Since the overdenture is mounted on dental implants, the bone gets stimulated during the chewing process through the implants anchored in the bone. Due to this stimulation, the resorption of the bone loss will be slowed down which occurs when the teeth are missing. When you have missing teeth, there is bone loss due to resorption that occurs naturally. This causes the distance between your nose and chin keeps reducing. Due to this, you get a very aged look and the face “sinks”. This process can be prevented due to the anchorage of the implants in the bone. The dentures snap fit on the implants that are placed in the mouth. Due to this, the dentures are firmly held in place and they do not move to provide better stability to the dentures. This provides more comfort and confidence to the patient since the patient does not have to worry about the dislodgement of the dentures. Since the dentures do not move, overdentures reduce the chances of sores and inflammation. Is Overdentures right for you? A simple dental check-up is required to check whether overdentures can work for you, also, there are multiple options for placement of implants for overdentures and hence a visit to Sabkadentist Clinic is required. Do a basic checkup of your medical and dental history and current status. Basic radiographs for selecting the best option for you. Prepare a treatment plan that suits best for you. After this preliminary check, the implantologist will ask for a CBCT Scan. The CBCT scan will provide more important information like the density of the bone, site of the implant placement, length and size of the implants and other parameters that would be required for the placement of the implants. Q: How can I know if the Overdentures for replacing my missing teeth is right for me? Each patient is unique and needs a personal checkup and consultation by the dentist. A simple FREE dental checkup at Sabka Dentist Dental Clinic will provide you all the information you need on whether overdentures are right for me and also how the same can be done. Q: How long does overdentures treatment take? Treatment times vary from patient to patient. The treatment plan will be decided by your dentist after the checkup. At this point, the dentist can provide you an estimate of the treatment time. Q: I am a denture wearer; can my current dentures be adjusted to be used for making the overdentures for implant-retained dentures? Yes, there is a possibility that your current dentures can be used will small modifications. But this can be checked only by the dentist during the first checkup with the implantologist. Q: I often suffer from inflammation and sore spots due to the denture moving and brushing against my gums when I chew food. Will overdentures help me in the prevention of these sore spots? Yes, Since the overdentures are anchored and snap fitted on the implants that are placed in the jaw or the mandible, they cannot move when you chew and hence, the sore spots are prevented and chewing is made a lot more comfortable by overdentures. Q: What can I eat with implant-retained overdentures? Overdentures provide you a new life especially in the case of foods that you can not eat when you have dentures. With implant retained overdentures, you can eat most of the hard and sticky food that you have to avoid when you are wearing conventional dentures. Q: Will I still to still the denture with adhesives? No, the overdentures are kept in place in the mouth through a snap fit on the implants and hence no adhesives are required. Dr. Preethi Nagarajan Dental Director of Sabka dentist says “overdenture will help to keep the denture in place and also sufficiently performs chewing process”. Dr. Ankita Gada Dental Diector of Sabka dentist says “the advance in Implantology made denture more easy to wear. Now patients can choose the suitable options”. Dr. Jena Shah Dental Director of Sabka dentist says “over denture is the good option for many as it can replace the missing teeth”.